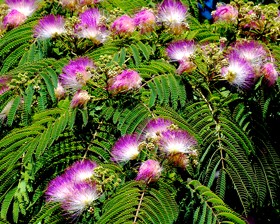 "Sensitive Plant", so called because the leaflets fold up in a most spectacular manner when touched or blown by the wind. Run your hand over the plant and the leaves will fold up and the leaf stalk will drop as if on a hinge. The movements are quickest with young plants in bright sunshine. They return to their normal condition in a few minutes. Soak the seed in hot water 60C for 20 minutes before sowing. Sow late winter to mid spring at 21 -24C on the surface of a good well drained seed compost and gently firm down. Keep soil damp but not wet. Do not exclude light, sealing in a polythene bag after sowing is helpful. Germination usually takes 21-30 days.